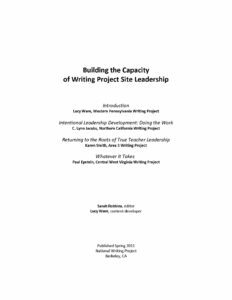 As Lynn Jacobs’ narrative illustrates, a teacher’s involvement in leadership may start small, but when the work is meaningful, her capacity for leadership will be enhanced. At heart, Lynn’s story is about mentorship. Her reflection on turning points in her journey strikes a universal chord: the give and take of collegial relationships, the ambiguity in roles, and the perceptions of inclusion and exclusion in leadership circles. Lynn’s growth emerges from her persistence. As she grows, she envisions how the abilities of other colleagues can be expanded as well. Her story teaches us that by recognizing the skills a colleague might bring to the process, leaders can imagine and implement improved programs for the site as a whole.